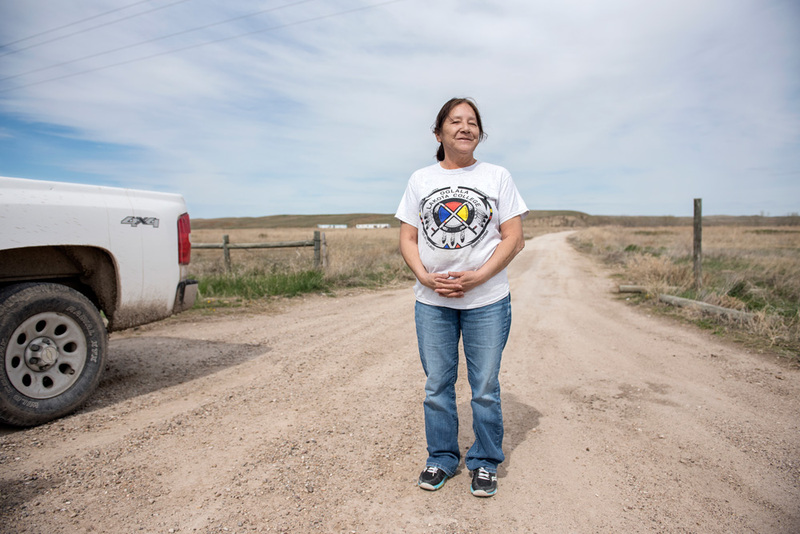 Gudrun Georges spent five days at the Pine Ridge Reservation in South Dakota with a non-profit group named One Spirit. One Spirit is not church affiliated, and is the only outside organization approved by the Sioux tribal council. Pine Ridge is an Oglala Lakota Native American reservation. "The portraits were mostly done when I drove around dropping off food boxes. Some of these people's addresses were impossible to find - there are no street names on the reservation. One big thing that happened when I was there was the closing of the White Clay liquor shops. The state of Nebraska refused to renew liquor licenses to the few stores right outside the reservation. They have a huge alcohol problem in Pine Ridge and even though alcohol is forbidden on the reservation, White Clay is a short drive or walk away. Most Indians were very happy about this decision. They fought these White Clay stores for years." Pine Ridge is the site of several events that marked tragic milestones in the history between the Sioux of the area and the United States government. Support One Spirit's efforts to wipe out hunger among the Lakota.